Dance Observer, New York, 1934-64. (FILM 18,320 V.1-2 1934-35 FAL; OCLC 1565860). Nathanson, Lucille. 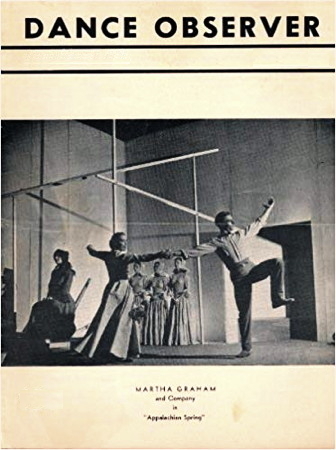 "An Index of the Dance Observer, 1934-1946." M.A. project, New York University, 1947. Dance Observer, New York, Oct 1939, p. 268-9. Fernandez Ledesma, Gabriel. "Five Mexican folk-lore dances," Issue missing from UT: OCLC 1565860. Available from Society of Folk Dance Historians, Austin TX 78705, 512/478-9676. Brief background of 5 dances; no step descriptions. Horst, Louis, author of Pre-Classic Dance Forms. New York: The Dance Observer, 1940. Also wrote about modern dance for the Dance Observer.